A new report says sea level rise has already cost New Hampshire more than $15 million in coastal property valuation in recent years. Researchers from Columbia University and the First Street Foundation, a national nonprofit, analyzed 2.5 million coastal homes in four New England states. They found increased flooding due to sea level rise caused those homes to miss out on more than $400 million in relative value between 2005 and 2017. The impacts to New Hampshire's tiny coastline are most concentrated in Hampton Beach, where the study found some homes are worth more than $200,000 or $300,000 less than they would be without rising seas. The study says Hampton Beach property values have suffered more due to increased tidal flooding than any other single community across Maine, Rhode Island and New Hampshire. Past research suggests a third of Hampton Beach homeowners could face chronic flooding from tides and storms if seas rise 8 feet, as predicted by some climate models, by the end of the century. Flood iQ maps show Hampton Beach, with flooding from a hypothetical Category 1 hurricane modeled at left, and current frequent tidal flooding modeled at right. Darker colors denote higher water. On the whole, the new study says tidal flooding has had less of an impact in New Hampshire than in neighboring states. Still, it says New Hampshire's 131 miles of "tide-influenced coastline" -- the fewest of any coastal state -- have seen a 260 percent increase in tidal flooding from 2 inches of sea level rise since 2000. The New England analysis adds to a previous study of property value loss in 14 other flood-prone states. That research found coastal real estate in those states was worth around $15 billion less in total than it would be otherwise. The researchers are adding newly studied to an online tool where homeowners can plug in their address and find out how their property values have been – and will continue to be – affected by climate change-related flooding. State legislators will consider how to prepare New Hampshire for the effects of climate change this session – including with one bill that would help coastal towns facing rising seas. Seacoast-area state Senator David Watters spoke at the Seacoast Environmental Film Festival Saturday, after a documentary about sea level rise on the Chesapeake Bay. Hundreds of people rallied for action on climate change in Keene and Portsmouth this weekend. They were part of demonstrations nationwide, ahead of a global climate summit in San Francisco this week. Seacoast families and students filled Portsmouth's Market Square with electric vehicles and signs denouncing fossil fuels and President Trump’s climate policies. 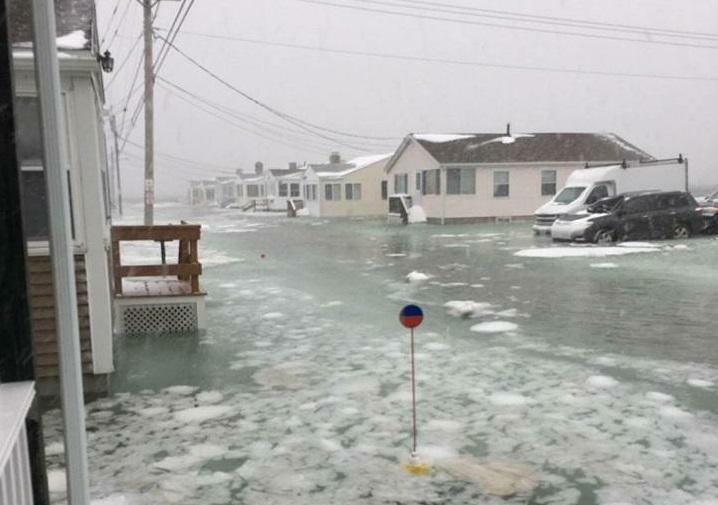 The New Hampshire Department of Environmental Services is offering grants to coastal communities looking to better prepare for the effects of climate change. A total amount of $200,000 is available to towns, state agencies, and private groups. Winning projects in the past have included everything from infrastructure projects, to flood plain studies, to educational outreach programs. New Hampshire’s Seacoast is home to some of the earliest history of European settlers anywhere in the country. Believe it or not, much of that history is still being uncovered. But now climate change and sea-level rise is adding new urgency to those efforts. NHPR’s Jason Moon joined a UNH researcher for a hike to see a centuries-old archaeological site that is literally washing away.